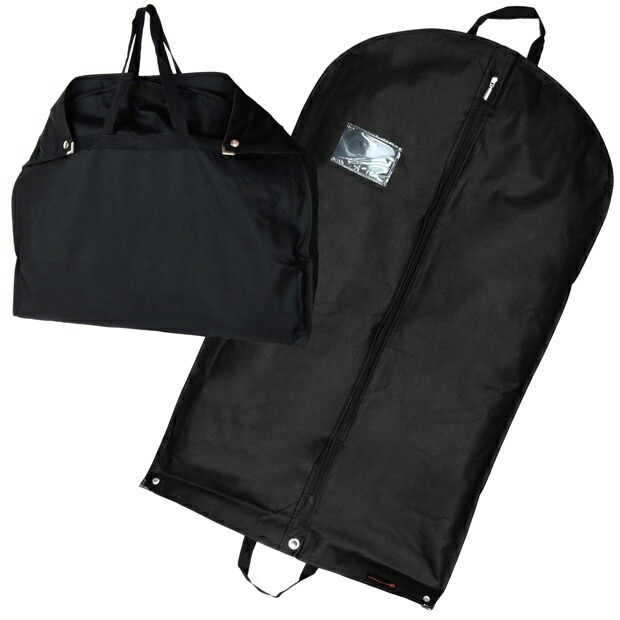 Our 40" premium quality black carry cover is a perfect addition to any wardrobe. Protects your garments from dirt, specks of dust and moths. Ideal for long-term storage as all Hangerworld branded covers are guaranteed to be acid free (ph neutral) and colour run resistant! Perfect for Suits, Jackets, Shirts, Trousers, Tops etc. The carry cover features a full length chromed zip for easy access to all your favourite garments. The cover can be hung full length or simply folds in half with two loop handles for comfortable carrying. Includes metal press stud fastenings, metal corner protectors and lower grommet to securely fasten when folded in half. The cover also includes a clear identity pouch to enable ease of carrier identification. Manufactured by Hangerworld Ltd.
Press stud fastenings, metal corner protectors and lower grommet. All Hangerworld branded covers are guaranteed to be acid-free (ph neutral) and colour run resistant.